The World’s First Candy Bar? What was your first candy bar? Butterfinger or Snickers maybe? Did you ever wonder where the first candy bar came from. Yes, there is that story about Joseph Fry in the 1800s, but there could a candy bar that arrived much much earlier than that. And now it’s back! In San Francisco recently, the 37th annual Fancy Food Show featured three modern versions of what could be called the first candy bars ever. It’s called panforte and it originated in Italy during the time of the Crusades as early as the 11th Century. It’s not a candy bar like you’d find today, it’s more of a very dense fruit and honey cake. In fact the word, panforte, literally means “strong bread”. But all the key ingredients are there: sugar, nuts, cinnamon, honey and more. And it’s made in a really similar fashion to many other candies we know and love, by heating sugar and honey to a high enough temperature to change their consistency to a hardened state. Now they’re coming back as a high-end dessert item. 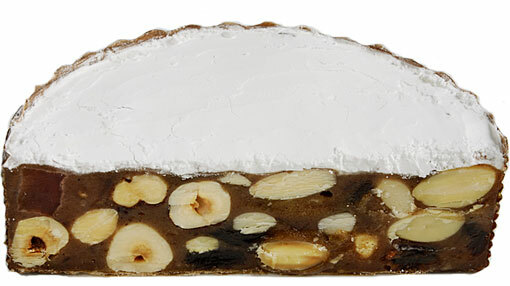 Several companies in California have begun making this medieval treat again and say that using local ingredients have made panforte more palatable to the modern candy lover. From dates to dried papaya, the ingredients vary slightly depending on the batch. Recent versions are reportedly softer and not as rock hard as their ancestor versions. Most of the current panforte connoisseurs laud the flexibility they have to be eaten as appetizers or desserts or even with a cheese platter. A candy bar for appetizer and dessert!? Sign me up.